Description: This tree is 50-100' at maturity (rarely taller), forming a single trunk about 2-3½' across and an ovoid crown with ascending to spreading branches. The trunk is normally straight and upright, forming a thick layer of gray bark with interlaced ridges that form narrowly diamond-shaped cavities. The bark of larger branches is gray and somewhat scaly, while young twigs are gray and smooth. New leafy shoots are green and hairless. Opposite compound leaves occur along the shoots and twigs. 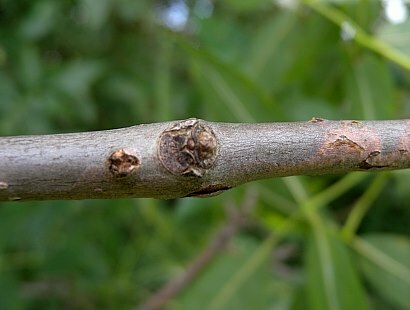 The scars from detached leaves along the twigs have a half-circle shape (or slightly less than a half-circle). These leaves are odd-pinnate with 5-9 leaflets (usually, there are 7), spanning about 6-14" long and about one-half as much across. The central stalk (rachis) and petiole of each leaf are light green and hairless (or nearly so). Individual leaflets are 2-5" long and ¾-2" across; they are elliptic or lanceolate in shape and smooth to slightly serrated along their margins. At the base of each leaflet there is a short petiolule that is light green and glabrous. The upper surface of the leaflets is medium to dark green and glabrous, while the lower surface is light green and glabrous (or nearly so). Each leaflet has 8-12 pairs of lateral veins that diverge from a central vein. Because Green Ash is dioecious, some trees have all male flowers, while other trees have all female flowers. These flowers typically bloom during mid-spring for about 2 weeks before the development of the leaves; they are cross-pollinated by the wind. The male flowers develop in tight clusters along 2nd-year twigs. Individual male flowers are less than 1/8" (3 mm.) across, consisting of a tiny tubular calyx and a pair of stamens (there are no petals). Initially, the male flowers are yellowish green to greenish purple, becoming gray-brown after the stamens release their pollen. The female flowers develop in small panicles along 2nd-year twigs. Individual female flowers consist of a tiny tubular calyx and a pistil with a single style. 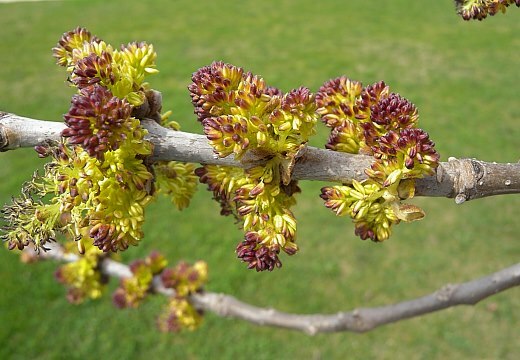 After the blooming period, the male flowers wither away, while fertile female flowers are replaced by drooping panicles of samaras (winged seeds). Individual samaras are linear-oblanceolate, consisting of a small ellipsoid body containing a single seed and an elongated membranous wing that is rounded or slightly notched at its tip. The membranous wing extends along both sides of the body to about one-half of the latter's length. As they ripen, the samaras change from light green to yellow, and from yellow to tan. They are dispersed by wind or water during the fall or winter. The deciduous leaves usually turn yellow during the fall. The woody root system is widely spreading and relatively shallow. This tree can resprout from its trunk after being damaged, otherwise it reproduces by reseeding itself. Cultivation: This tree prefers full sun to light shade, moist conditions, and soil containing clay-loam or silt-loam. Occasional flooding is tolerated. Growth and development are moderately fast for a tree. Green Ash typically lives 50-100 years, but sometimes as long as 200 years. The trunk and branches are frequently adorned with lichens and moss. Range & Habitat: The native Green Ash is occasional to locally common throughout Illinois (see Distribution Map). Habitats include floodplain woodlands, mesic woodlands, riverbanks, swamps, and abandoned fields. Such deciduous trees as Silver Maple, Red Maple, Shellbark (Kingnut) Hickory, American Sycamore, and Eastern Cottonwood are common associates of Green Ash. It is often cultivated as a landscape tree. Faunal Associations: Many insects feed on the foliage or bore through the wood of Green Ash. These species include the caterpillars of the butterfly Papilio glaucus (Tiger Swallowtail), the caterpillars of many moths (see Moth Table), and the caterpillar-like larvae of Tomostethus multicinctus (Brown-Headed Ash Sawfly) and Tethida barda (Black-Headed Ash Sawfly). In the Midwest, one of the biggest threats to the survival of Green Ash and other Fraxinus spp. is a beetle that was introduced accidentally from abroad, viz. Agrilus planipennis (Emerald Ash Borer). Its larvae bore through the wood and often kill native Ash trees. Other insect feeders include Tropidosteptes amoenus (Ash Plant Bug), the flea beetle Trichaltica scabricula, larvae of the wood-boring beetles Tylonotus bimaculatus (Ash & Privet Borer) and Neoclytus acuminatus acuminatus (Red-Headed Ash Borer), the aphids Prociphilus americanus and Meliarhizophagus fraxinifolii, Lepidosaphes ulmi (Oystershell Scale), and the larvae of the gall fly Dasineura fraxinifolia (see the Insect Table for a more complete listing of these species). The seeds of Green Ash are eaten by such birds as the Wood Duck, Wild Turkey, Bobwhite, Cardinal, and Pine Grosbeak. The seeds are also eaten by the Fox Squirrel, Red Squirrel, and White-Footed Mouse. The foliage and twigs of Green Ash are palatable to several hoofed herbivorous mammals: this includes deer, cattle, horses, and sheep. Rabbits eat the foliage of young saplings, while the beaver uses the wood as a food source. American Bison are attracted to the rough bark of mature trees, using their trunks for rubbing and horning activities. Green Ash provides cover, habitat, and roosting sites for the Eastern Screech Owl, Cooper's Hawk, Wild Turkey, Ruffed Grouse, Common Grackle, and other birds. Photographic Location: The photographs were taken at Busey Woods, Crystal Lake Park, and the webmaster's apartment complex in Urbana, Illinois. Comments: The typical variety of this tree, Fraxinus pennsylvanica pennsylvanica, is called 'Red Ash.' In Illinois, Red Ash is about as common as Green Ash; it also has a similar distribution and prefers similar habitats. Some authorities treat Red Ash and Green Ash as separate species (e.g., Mohlenbrock, 2002), while others don't even recognize them as distinct varieties of the same species. Unlike Green Ash, Red Ash has hairy leaf undersides, petioles, and shoots. Otherwise, they are very similar to each other, if not more or less identical. As treated here, they are considered distinct varieties of the same species. Other scientific names of Green Ash are Fraxinus pennsylvanica subintegerrima and Fraxinus lanceolata. Several other species in this genus occur in Illinois; they are commonly referred to as White Ash, Blue Ash, Black Ash, and Pumpkin Ash. 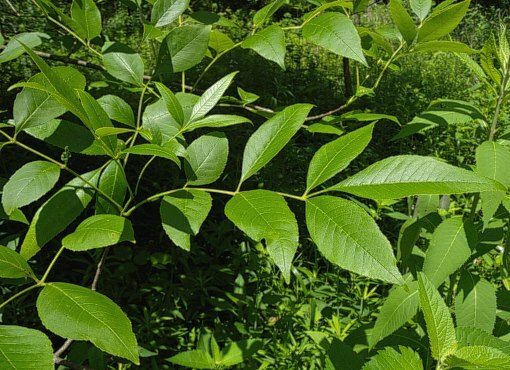 To distinguish Green Ash and Red Ash from these other species it is necessary to consider various characteristics of their leaves, samaras, twigs, and leaf scars. 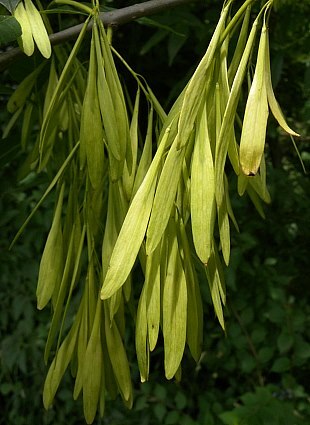 For example, another common species, Fraxinus americana (White Ash), differs from Green Ash and Red Ash by having U-shaped leaf scars, leaves with slightly whitened undersides, and samaras with winged membranes that don't extend beyond the bodies of their seeds. The wood of Green Ash has properties that are similar to White Ash; they are both used to make furniture, sporting equipment, and other articles of commerce.